Kristi Wallace and her assistant Katie Mulliken sat in the mud, slicing through chocolate cake layers of peat and ash. Wallace studies tephra — volcanic ash — at the Alaska Volcano Observatory. 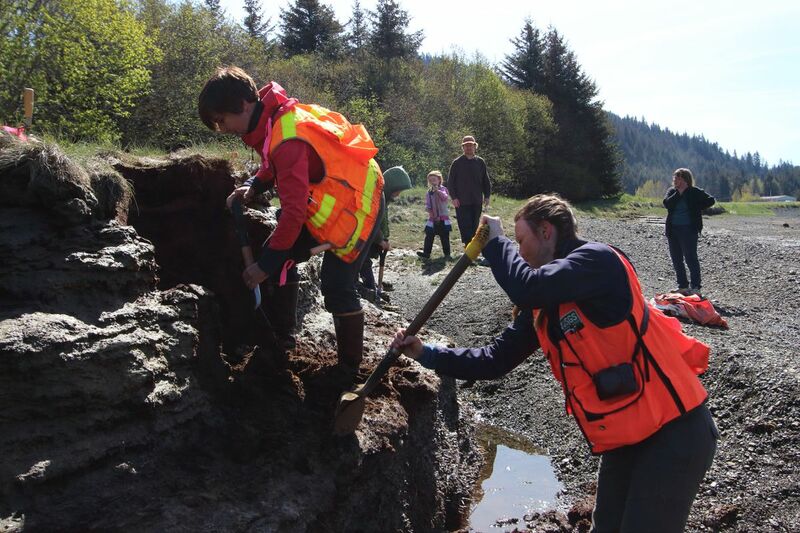 They had spent the morning digging through a cliff of tidal peat on the Seldovia slough, smoothing out the face until we could see every layer of the past — centuries of swamp plants growing and dying, interrupted by catastrophe. 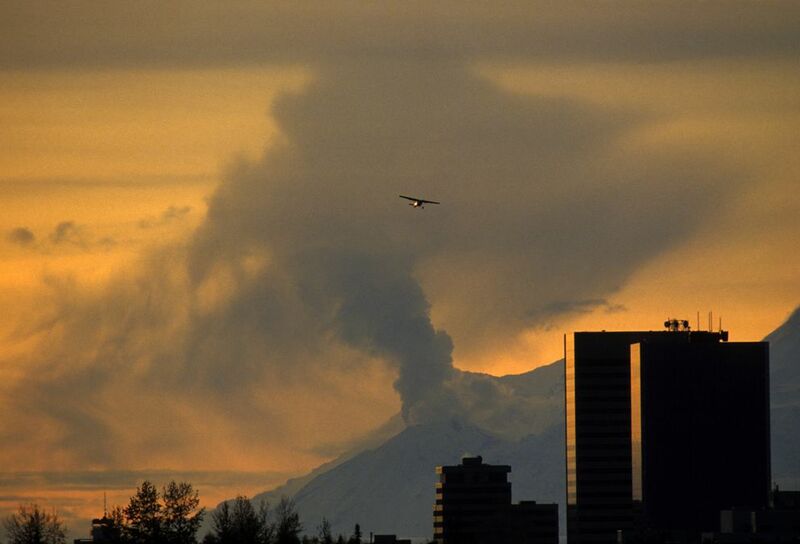 Alaska volcanoes erupt explosively. Ash clouds billow, follow the wind, and rain down in millimeters, inches, sometimes feet-thick layers of dust and rock. They smother plants, bury villages, and in recent years, threaten the engines of global aviation. On the Aleutian chain, Mount Bogoslof has been erupting for months. In 2009, I stood in my driveway and watched a cloud of ash mushroom from the peak of Mount Redoubt. Yet these — all the eruptions anyone can remember — are barely a blip in what our volcanoes can do. Wallace pressed a child's plastic alphabet letters into the dirt; A, B, C, D … Each one marked a layer of volcanic ash. Each one marked a catastrophe. "People always think they've found 1986 Augustine, or 2009 Redoubt. But you can't even see those eruptions. We're just looking at the really big ones." We could see the ash layer from 1912 Katmai, last century's largest eruption, as a scribble of gray just below the living grass. Lower down, there were other, thicker layers. And Wallace didn't know where they had come from. She knows most ash layers by heart. Augustine spews white, while ash from Spurr is a lumpy, ugly gray. 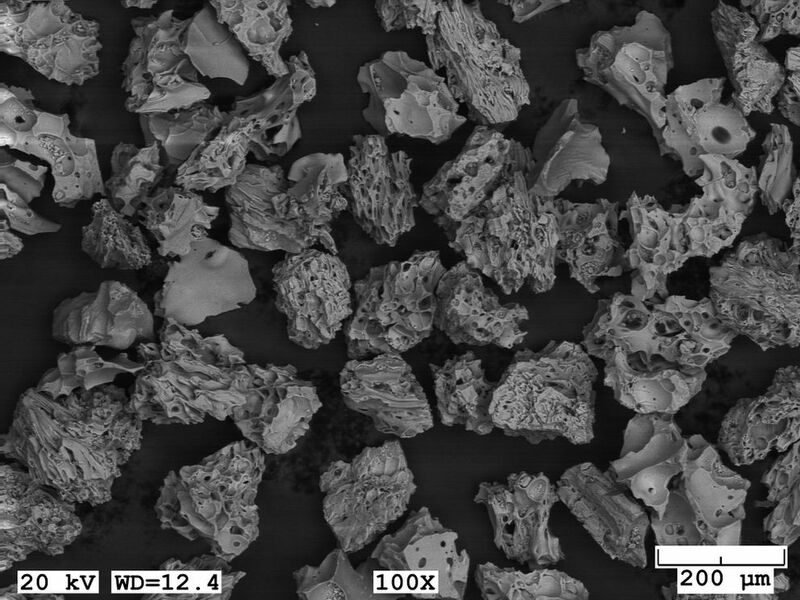 Under a microscope, the size, shape and color of the ash particles, along with their individual chemistry, are unique to each volcano. The mountains are like criminals; wreaking havoc and leaving their DNA behind. These traces tell us which volcanoes erupt most frequently or violently. They tell us when each eruption happened and which areas were hit by the ash. They tell us which mountains to watch out for. Five hundred years ago, an eruption blanketed this region in a dusty coat of brown. "Under the microscope it's just these beautiful honey-brown glass shards," Wallace said, waxing lyrical about the particles of ash. "And I've never seen it before." A sample that stumps her is more than just a scientific curiosity. It's also an unknown hazard. Wallace has spent her life studying volcanic ash in Alaska. Twenty years ago as an undergrad, she created the Alaska Tephra Lab in a corner of common lab space at the Alaska Volcano Observatory. After graduate school, she returned, slowly growing the lab from a corner of a storage room to a dedicated three-room space with a powerful electron microscope. "It was a niche not filled," she pointed out. "Ash is the major hazard of Alaska volcanoes, so here was something major, uber important that wasn't being done." In 1989, a year after the observatory was founded, ash from Mount Redoubt nearly brought down a jet. Most of our volcanoes are remote, but their ash can reach some of the most heavily used paths in global aviation. In cargo traffic, the Anchorage airport ranks fourth in the world. The tephra lab is stacked with carefully labeled boxes and bags of ash and mud, and it is immaculate. The back room is occupied by fundraiser T-shirts and a scanning electron microscope capable of enlarging a single particle of ash until every crevice can be seen. It is so sensitive to vibration that Wallace has to shoo a particularly loud colleague out of the room when it is running. "During eruptions (when people send in fresh samples to analyze) it smells like a sulfur pit in there. Some people can't stand it, but to me, it just smells like fresh rock." 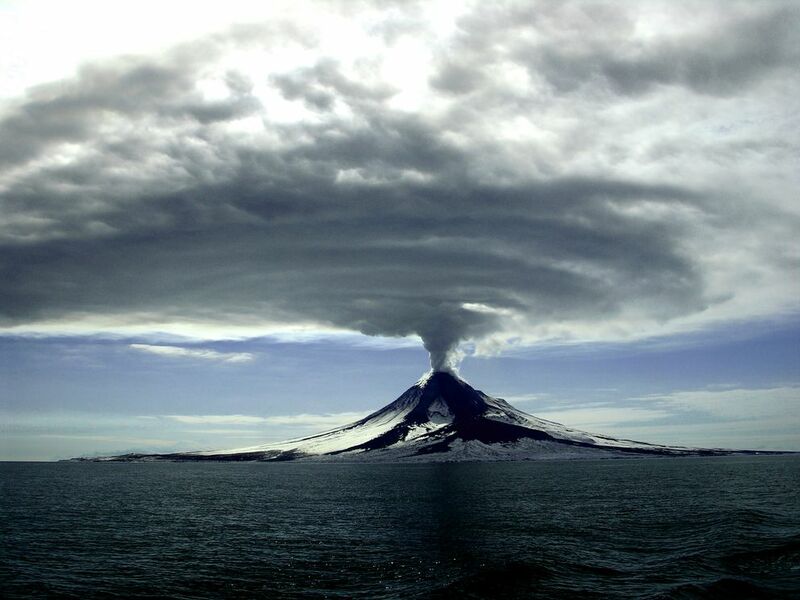 On average, we have one or two eruptions a year in Alaska. We have more than 130 volcanoes, including 90 that have erupted since the end of the last ice age, and 50 that have erupted since written records began in 1760. To a geologist, though, those 250 years of records are nothing. To look further back, they dig. A few hours after we left the slough, I sat on the grass, watching the volcanologists investigate a half-dug outhouse hole. Below the salmonberry roots, layered between the masses of dark soil, were rippled blobs of ash. If you dig a hole in your yard, you might find them too. It only took a glance for Wallace to be sure that most of the ash in the outhouse hole was from Augustine, our closest volcano. In the field, she talks about herself as the lab instrument. "I have to calibrate my eyes," she says, or "calibrate my fingertips." Until she pointed them out, I could only see the brightest layers. But I could feel them all. Volcanic ash is like ground glass. It feels sharp and gritty between your fingertips. "Sometimes," said Mulliken, Wallace's assistant, "you have to put it in your mouth, to tell it apart from loess (wind-blown glacial silt)." The peat felt greasy on my tongue, and tasted about like I thought dirt would. The ash was nearly tasteless. Damp and crunchy. The color helps identify the volcano. The pattern of ash across the landscape — how thick, how widespread — tells us how big or close an eruption was, and which way the wind was blowing when it happened. The dirt beneath the ash gives us the time. Digging down is digging into the past. Sometimes an inch down is a hundred years back. Sometimes a thousand. To figure out the exact age of an eruption, Wallace takes a sample of the dirt just below an ash layer — the plants that died when that ash fell. She sends those off to another lab, which can measure the amount of radioactive carbon-14 remaining in the mud, and tell how many years ago they died. Archaeologists love this. Once a sequence of ash layers has been puzzled out, it acts as a bar code for the past. Archaeologists can use the distinctive pattern of ash layers to match up dig sites — to figure out who lived when. Paleoecologists use the bar codes to look at the shifting of ecosystems. Geologists use it to date past earthquakes and tsunamis. You can care about tephra even if you don't care about volcanoes. Understanding tephra is usually harder than finding it. When Wallace started documenting Alaska tephras, another graduate student had unearthed dozens of them from the mud beneath Kenai Peninsula lakes. All were mysteries. So she started her studies at the volcanoes themselves, slowly working her way outward toward the distant places they buried. What if there's a volcano no one has looked for? In the outhouse hole, those "beautiful honey-brown glass shards" look exactly like light brown mud. To a geologist, they look a lot like a layer of glacial silt. For years, everyone missed them. They don't match up with Redoubt or Augustine, our closest known active volcanoes. Could Mount Iliamna, in between the two, be more active than anyone thought? That was Wallace's first idea. But as she helicoptered around the inlet, digging and sampling, the layers told a different story. Once her eyes were calibrated, Wallace found the mystery ash everywhere, from an Anchor Point gravel pit, to the Barren Islands about 60 miles from Homer, to the banks of the Kamishak River. The pattern of ash fall traces an outline of the eruption plume, which looks like it came from somewhere to the southwest. The ash doesn't match Katmai either, or the known eruptions of Kaguyak crater. Could it be an unstudied dome near Kaguyak? Could it be Mount Douglas, a 7,000-foot volcano south of Augustine with active fumaroles but no recorded activity? Five hundred years isn't that long ago. Perhaps someday we'll be covered by another layer of dirt-brown ash. Alaska is peppered with far more volcanoes than volcanologists. Whole mountains still can be mysteries. Erin McKittrick is a writer, adventurer and scientist based in Seldovia. She's the author of "A Long Trek Home: 4,000 Miles by Boot, Raft and Ski," the children's book "My Coyote Nose and Ptarmigan Toes" and "Small Feet, Big Land: Adventure, Home and Family on the Edge of Alaska." Her latest book, "Mud Flats and Fish Camps: 800 Miles around Alaska's Cook Inlet," was published earlier this year. You can find her at GroundTruthTrekking.org. Mud Flats and Fish Camps.